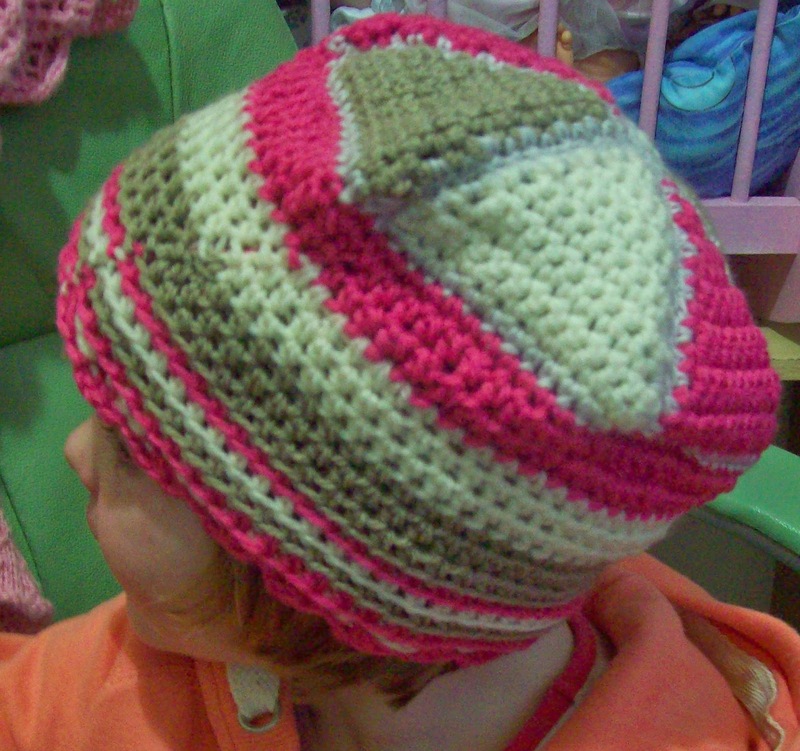 This is a fun little crochet project for a hat, almost as much fun as playing with mud pies! I have been toying with this idea for some time now, I had some left over yarn from recent projects sitting in front of me on my work bench and decided to start making the triangles from the yarn scraps. 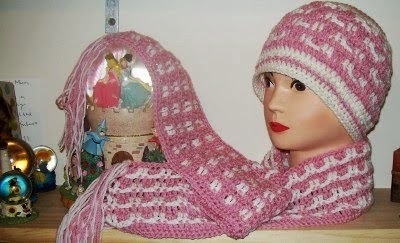 The information I am giving you are instructions for making the hat rather than an exact pattern as there are so many variables to cover in making this style of hat for all sizes, I will try and be as clear as mud. I was making the the hat to fit a 2 to 3 yr old, but this can be made in any size by taking your head measurements and divide that by 6. Once I had made a few triangles, I soon realized that there was more to making the hat this way than what I had originally planned. The triangles would form the crown of the hat and every crown needs measurements. The triangles I had made were 4 inches wide, I was making a hat for a 2 to 3 year old, so my 6 triangles at 4 inches wide measured 24 inches around, a size 2 to 3 hat is approx 20 inches around, this was going to be too large for the size 2 hat in a beanie style, but I knew it would be a great size for a beret. 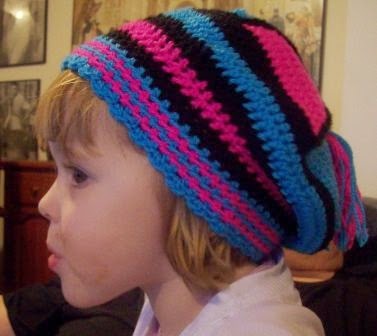 I have made 2 sizes with this design now, the 3 inch triangles have given me a beanie style hat for a 2 to 3 yr old. The triangles are made with the sc stitch, beginning at the peak of the triangle with gradual increases on the sides of alternate rows see's a well formed triangle. 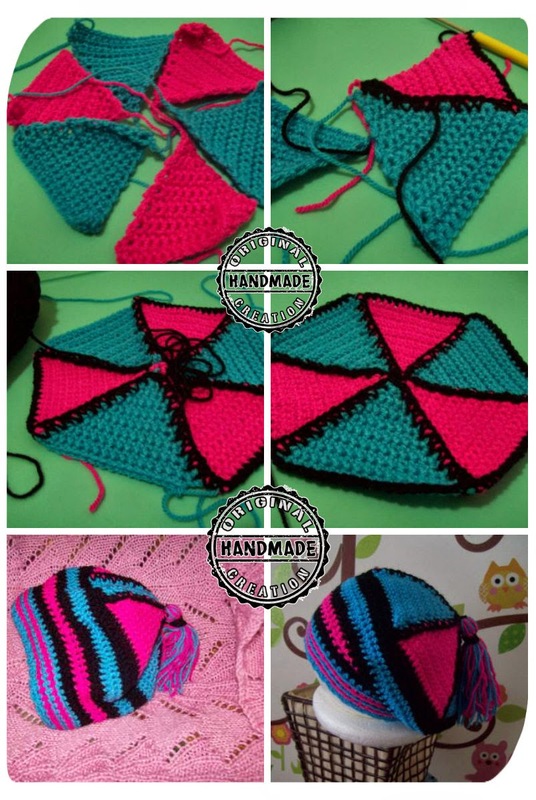 Each triangle once finished is crocheted around with an alternate color with the sc stitch and using 2 sc's in each corner as you turn to work the next side. The 6 triangles are then sewn together to form a circle for the crown of the hat, there may be a small opening where the peaks of the triangle are joined, leaving a tail from joining the triangles you can pick up and crochet st's in a sl st to close this hole, or sew it closed. 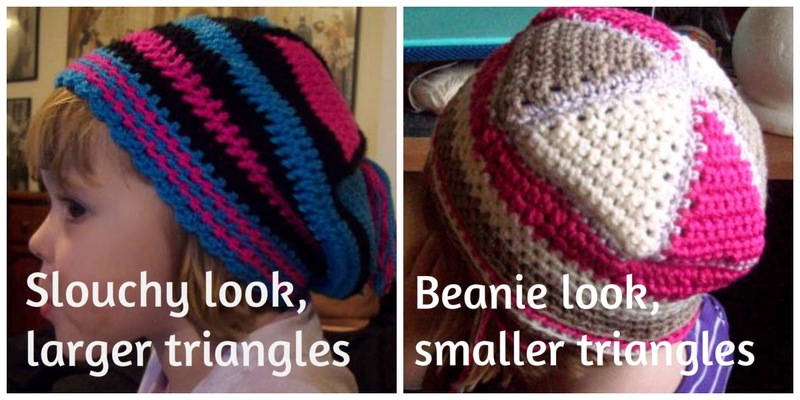 For an adult size beret I would make the triangles approx, 5 inches, for an adult size beanie, I would make the triangles 4 inches. 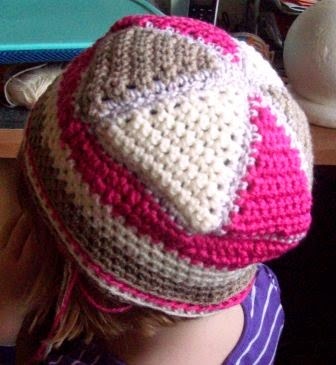 After joining all of your triangles to make the circle, the next stage of the hat is to join your yarn in any sc space at the bottom edge of the crown. Work 1 sc in each sc around the hat and sl st to join. Make a note of how many sc's you have made from this round and measure the circumference of the hat. 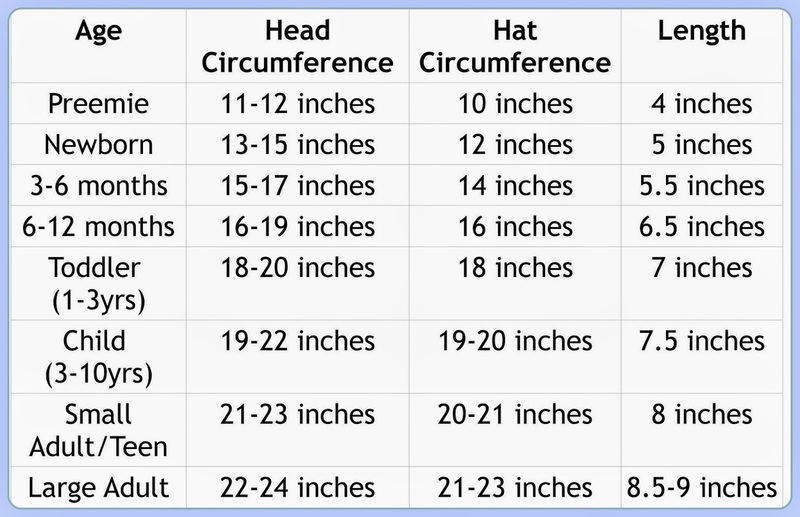 This size chart above is a guide for a beanie size hat, it is also the size you will need for the beret hat once you need to decrease for the brim of the hat. For a beret style hat a count of approx 100 st's or more is great, make several rows with this count using the hdc st, for the depth of your beret style that you are pleased with, then follow the next set of instructions to decrease for your hat edge. For a beanie style hat and the beret hat edge, you will need to make decreases, using the hdc st decrease in every 6th stitch around (dec stitch 6 and 7 together), it's more than likely that your st count will not be accurate, but we just need it close enough. Using the size chart for your measurements, you may need to further decrease to get your size, the next row you can decrease every 5th and 6th st's together, the next round can be decrease every 4th and 5th st's together until you get your size. Once you have the size you need,continue working the hdc st in each st round until you have reached the length of your hat. Refer to the size chart or try your hat on. It's a nice little touch to work your hdc's into the back loops only for the hat edge. Then you will finish off and sew in your ends. You want your triangles the same size, the green triangles below are too small, a difference with yarn brand or ply may cause this.